I thought I’d start the week’s posts with a look at the controversial Ragwort plant. It’s in full bloom now and its golden flowers are very noticeable in a wide variety of habitats, on roadsides and railway embankments, on waste ground and clifftops, but it also occurs in fields and pastures, which is where its troubles begin. Other names: Ragweed, Tansy Ragwort, Staggerweed, Stinking Willie, Stinking Nanny, Dog Standard, Cankerwort, Stammerwort. The New Atlas of the Flora of Britain and Ireland (2002) shows Ragwort as native and states that ‘the distribution of S. jacobaea is unchanged from the map in the 1962 Atlas’. Common Ragwort is generally known as a biennial plant that overwinters as seeds or as leaf rosettes, but in certain conditions it may survive as a perennial. The leaves may be light-dark green and are attractively deeply cut and lobed. The plant grows from 30-100cm in height, with woody stems coloured red at their base. The upper part if the stem is branched, bearing golden yellow flower heads in large, dense terminal clusters that are almost always rayed and daisy-like. The issues with ragwort arise from the fact that the plant contains poisons that may be lethal to domesticated grazing animals if sufficient quantities are ingested over a period of time. For this reason ragwort is one of a very few plants listed in the Weeds Act (1959). 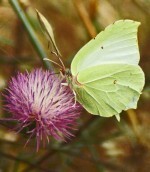 Opinions concerning the dangers to livestock presented by the presence of the plant have long differed and continue to do so; there is sustained pressure from some quarters that wish to see the plant eradicated, but more recently there is also a strong counter-argument from conservationists for its retention, as its importance has been recognised as a food plant for a number of insect species. There is a great deal of information and argument concerning the plant to be found on a variety of websites on the internet. The first of the following pieces was written 94 years ago, giving some indication of how long this controversy has raged. I found it interesting and it explains how the plant may be inadvertently fed to animals as a component of hay, and the very unpleasant effects that may have on them. “It is not generally recognized that the common British Ragwort is poisonous to cattle. This probably arises from the fact that poisoning under natural conditions is a slow process, that is to say, an animal does not receive, and could not eat enough of the weed at one meal to cause acute poisoning. On the other hand, the poison is cumulative in its action; with continuous doses the amount of poison which becomes available is sufficient in time to cause very serious symptoms which often end in death….. The following represent broadly the circumstances of the cases which have recently come to the notice of the Board. Pastures containing a considerable proportion of the weed were cropped in the hope that the comparatively early cropping might help to get rid of it. The crop was made into hay, and owing to the prolonged spell of cold weather and the scarcity of other feeding stuffs, this was fed later and in considerable amount to animals at pasture. Much more up to date, the following points are extracts from a very detailed and compelling report on the importance of the plant to conservation from Buglife – the Invertebrate Conservation Trust. 1. 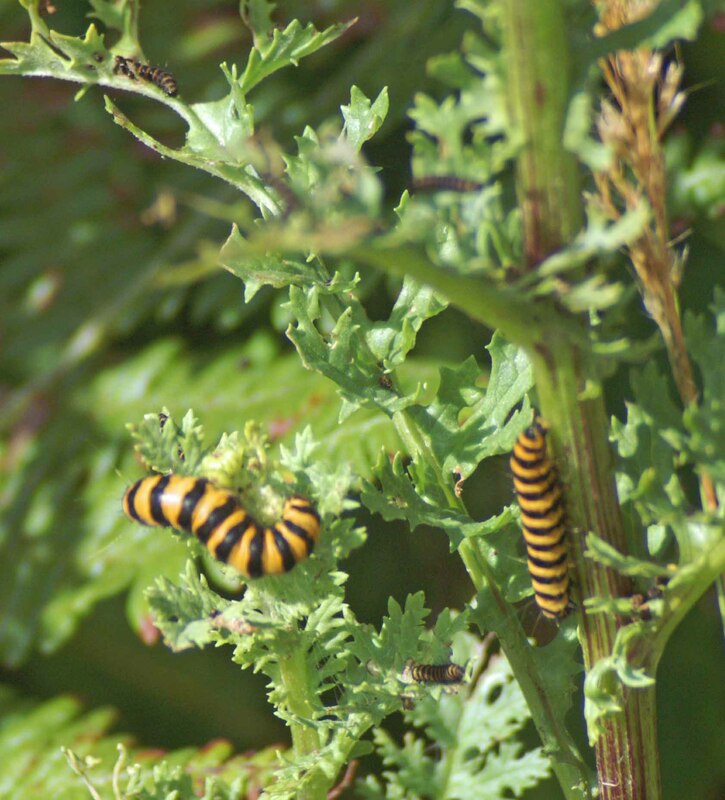 At least 30 species of insects and other invertebrates are totally dependent on Ragwort as their food. 2. Many other species of insects which eat Ragwort, or require the nectar and pollen from the flowers, can also use alternative plants. However, Ragwort is often significant in supporting viable populations, especially in districts where such alternative plants may be absent or too scarce. Solitary wasps (at least 18 species; not the sort to harm people). Conopid flies (parasitic on solitary bees and bumblebees). Moths at night (including at least 40 noctuid moths).3. Ragwort is among the select few plants listed in the Weeds Act (1959). The listing was primarily concerned with control where agricultural production may be affected by its presence, especially its toxicity to grazing stock. 4. 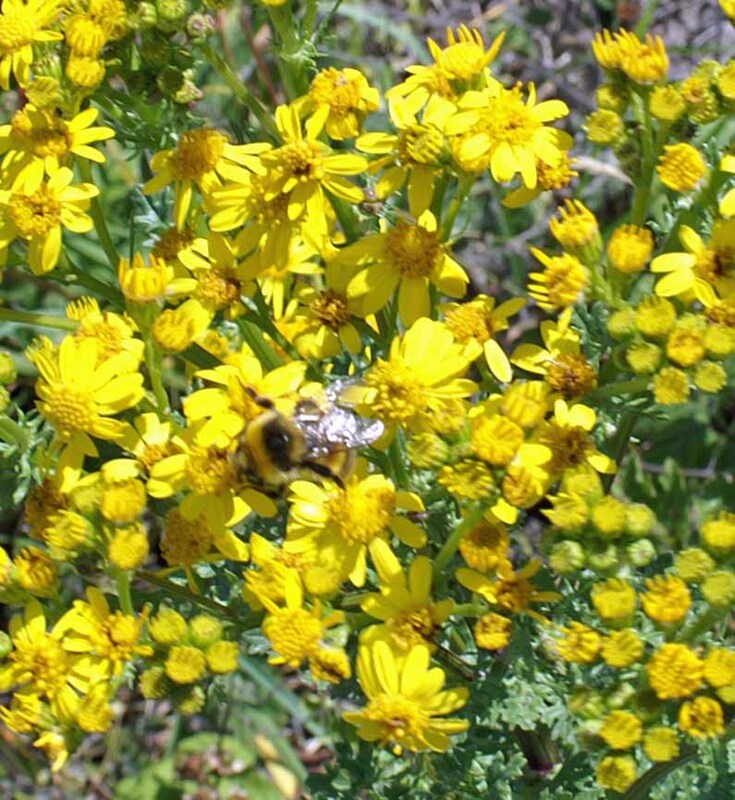 Since 2003, the Ragwort Control Bill has been going through parliament. A Defra code of practice has been produced that will be backed by enforcement of Ragwort control where toxicity is perceived as sufficient risk. In particular, this covers land grazed by horses and hay fields supplying their fodder (these days largely a recreational rather than agricultural issue). 5. Both insect faunas and horses (and other farm animals) can co-exist provided control measures are targeted where really needed. In many situations Ragwort is doing no harm. 6. If the richness of the fauna is to have a future, the current over-reaction, indeed hysteria in some quarters, needs to be defused. Public and other bodies are seemingly being pressured beyond limits of tangible problems, and the horse fraternity and general public are encouraged to eliminate Ragwort, which in practice often means any plant that looks vaguely similar.It’s amazing:- The future of so many species is now dependent on an understanding of sustainability: how to make use of the countryside and town whilst maintaining biodiversity.Ragwort Control1. In some circumstances Ragwort does need control but more widely the issue can be hyped-up to result in over-reaction. The purpose here is to look at the facts, especially in relation to the high profile concern over toxicity to horses.2. The toxins (pyrrolizidine alkaloids) in Ragwort can cause liver poisoning. It is a cumulative poison, eventually leading to the rather rapid onset of symptoms which precede rapid death. The plant has the alternative name Stagger Weed, referring to one of the more obvious symptoms. The lethal volume of Ragwort is said to be 7% of body weight for horses. Cattle are prone, sheep apparently less so (although it is difficult to find solid evidence of any fatal effects on other livestock). Young plants are less toxic than well grown ones. 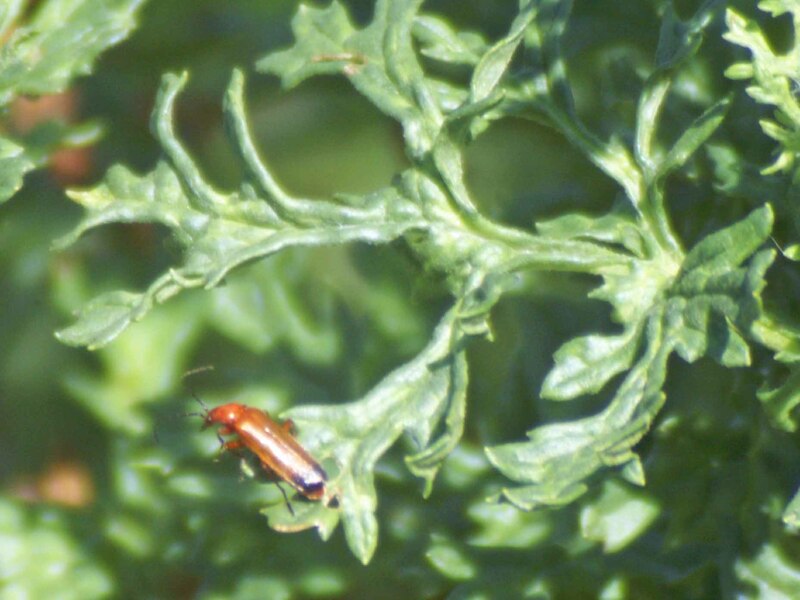 The main insects that can devastate populations of Ragwort are the Cinnabar moth and the flea beetle Longitarsus jacobaeae. Some of the fly larvae and moth caterpillars have the capacity to cause loss in seed production. The remaining fauna collectively impact upon the health and vigor of Ragwort, though the significance will depend on local circumstances. On the whole, districts where Ragwort is always present should have the most complete insect faunas, thus best balanced to continuously effect control. It is usually where poor land management allows excessive colonisation by Ragwort seed that the man-made problems arise. Ragwort was formerly much employed medicinally for various purposes. The leaves are used in the country for emollient poultices and yield a good green dye, not, however, permanent. The flowers boiled in water give a fair yellow dye to wool previously impregnated with alum. The whole plant is bitter and aromatic, of an acrid sharpness, but the juice is cooling and astringent, and of use as a wash in burns, inflammations of the eye, and also in sores and cancerous ulcers – hence one of its old names, Cankerwort. It is used with success in relieving rheumatism, sciatica and gout, a poultice of the green leaves being applied to painful joints and reducing the inflammation and swelling. 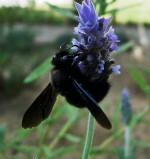 It makes a good gargle for ulcerated throat and mouth, and is said to take away the pain caused by the sting of bees. A decoction of the root has been reputed good for inward bruises and wounds. In some parts of the country Ragwort is accredited with the power of preventing infection. & seems but very shadows in thy sight. 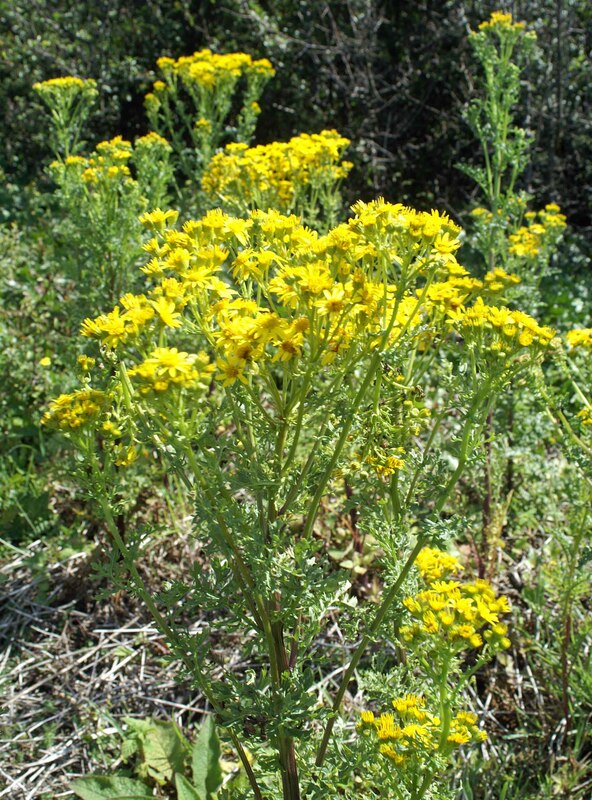 This entry was posted in Nature and tagged plants poisonous to animals, ragwort, ragwort and animals, senecio jacobaea, wild plant with golden yellow flowers. Bookmark the permalink.